Each year, Inc. Magazine publishes its list of the 5000 fastest-growing publicly held small companies in the U.S. and follows the announcement with a black-tie awards ceremony at the Inc. 5000 Conference & Gala. To land on Inc’s list is not only public recognition that a company is on a successful track, it also serves as a source of pride for up-and-coming companies. 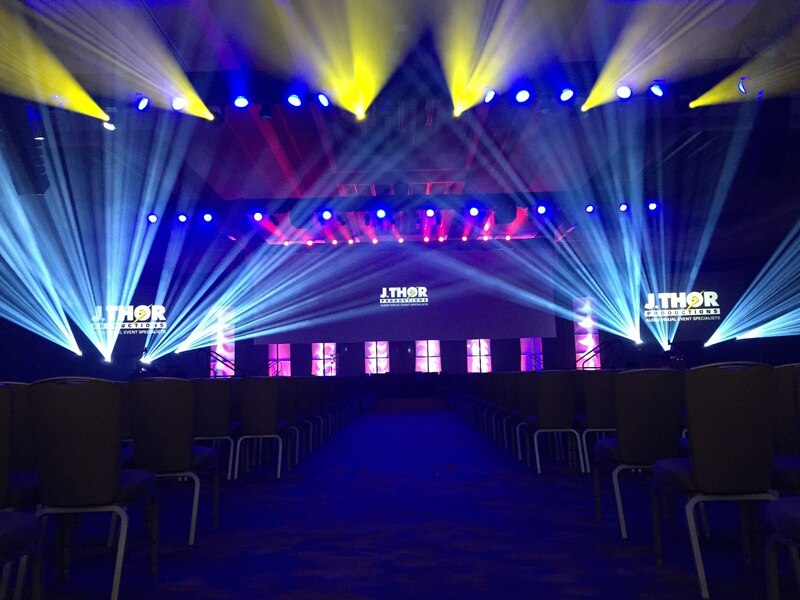 J. Thor Productions, a growing live event production company based near Tampa, Florida that specializes in corporate events coast to coast, turned to its new inventory of Elation Professional Satura Profile™ and Platinum FLX™ fixtures to light the awards event. After successfully working an Inc. Invest event last May, J. Thor Productions was called on to do the Inc. 5000 Awards, their first involvement in the show. 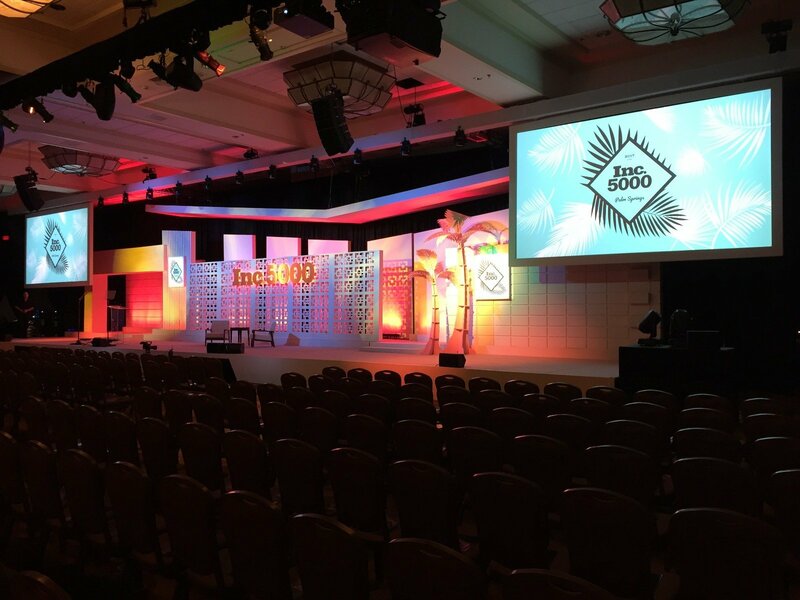 Founded and run by J. Thor Gogolen, the company, along with planning partner NY Toast, served as event producer and handled all sound, lighting and video for the 2017 Inc. 5000 Awards. A custom set design by ZH Productions, a 1960’s style California hotel painted all in white, proved the ideal canvass for lighting designer Brian Silva to paint with colored light. “The set was highlighted using the 4-blade framing shutters of the Satura Profile,” stated J. Thor Gogolen, whose company purchased eight of the LED-based CMY color mixing fixtures in October and have since acquired an additional eight. “There were lots of straight lines in the set and the Satura’s were perfect for framing off the different aspects of the set. Framing shutters are a necessity when you’re painting sets and for us it is the most important feature of the fixture. They make for more accurate designs.” The Satura Profile houses a host of other design features like gobos and prism, which the designer also turned to on occasion to lay down pattern. The set was covered by three truss elements, a 100’ upstage truss with LED moving heads used as backlight, an 85’ downstage projection truss housing stage wash fixtures, LED moving heads and 4 Satura Profiles used to frame and color the set, and a house delay truss holding 4 Satura Profiles along with 8 Elation Platinum FLX. “The FLX provided punch, pattern, movement and were used for awards ballys,” Gogolen said. “While we had to be careful not to effect the projection, the gobos played a huge part in the design and the fixtures really provided pop.” The Platinum FLX, hybrid spot/beam/wash lights with 470W lamp and 20,000 lumens of power, were part of J. Thor’s October purchase, an acquisition since added to with Fuze Wash™ single-lens LED wash lights, Chorus Line™ LED batten fixtures, and the aforementioned Satura Profiles. At the conclusion of the awards show, the Elation gear had little time to rest however and was immediately put to work on another event. The Satura Profile and Platinum FLX fixtures went straight from the Inc. 5000 Awards in Palm Springs to San Diego, where Gogolen used them for a corporate event at the San Diego Marriott for Orange Theory Fitness, one of the fastest growing fitness franchises in the U.S. and a consistent name on Inc.’s fastest growing companies’ lists. Elation dealer Freed Sales played an important role in helping Gogolen choose and acquire its fixtures. “They have been great to work with and were instrumental in giving us the opportunity to get Elation. They take great care of us,” Gogolen concludes.